Waisman Center Preschool teacher Kerri Lynch interacts with students at the classroom’s “peace table,” where books and props related to a kindness research study are kept. The research protocol requires that the students remain anonymous and that their faces not be shown. 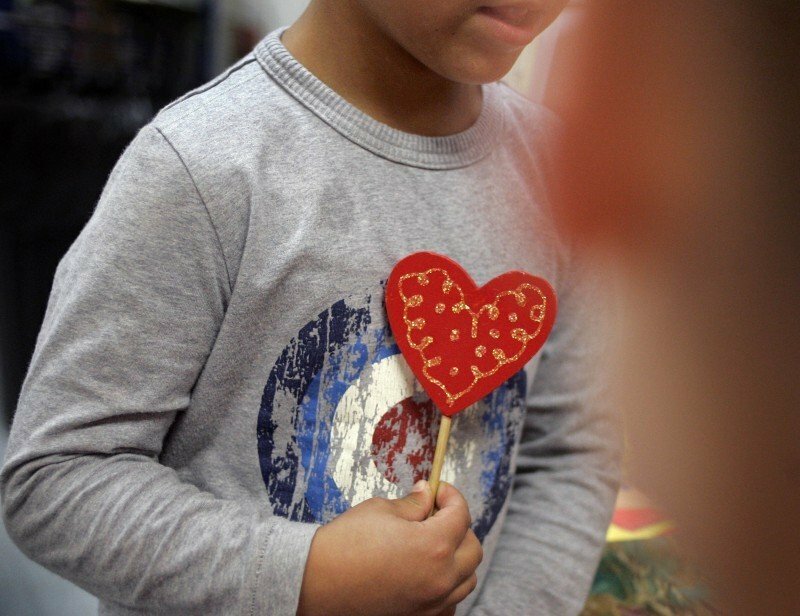 A student in a research study on kindness at the Waisman Center Preschool holds a heart wand, which lets other children know that he’s speaking from the heart and that it’s important to listen attentively. Homemade snow globes called “mind jars” teach children at the Waisman Center Preschool to calm themselves instead of acting out in anger or frustration. After shaking the mind jars, children wait until the glitter settles before saying anything. They repeat as needed. When children in Kerri Lynch's preschool class get angry, they shake their "mind jars," homemade snow globes filled with water and glitter. Until the glitter settles, they don't talk, taking deep breaths instead. "You watch your mind calm down," said Will, 5. The mind jars are part of a study at the Center for Investigating Healthy Minds, a research hub founded in 2008 within the Waisman Center at UW-Madison that takes an atypical approach to scientific inquiry. Instead of studying disease and disorder, researchers probe positive attributes such as compassion and contentment. The preschool study is attempting to determine whether children can be taught, in a statistically significant way, to be kinder. It is among the main research projects under way at the center, and it has hit a nerve with parents. "They're wildly enthusiastic," said UW-Madison neuroscientist Richard Davidson, center founder. "I get barraged by requests on a weekly basis from parents wanting to know if they can enroll their children in this program or if we can come to their school." Davidson theorizes that many children have become overwhelmed and distracted with the rise of the digital age and a culture that often focuses on qualities such as greed and fear. "Parents are looking for alternatives, they're looking for antidotes," he said. Although the study needs to be expanded before conclusions are drawn, Davidson said he's encouraged by early results. "I think this could make a very significant difference in the early years of a child's education, which provide the backdrop and foundation for everything that comes next," he said. To address some of the curiosity around the research, the center will hold a public discussion Saturday about the study, as well as broader topics such as the relationship between neuroscience research and classroom learning. Last fall, 15 students in a classroom at the Waisman Center Preschool went through an eight-week "kindness curriculum" created by the Center for Investigating Healthy Minds. 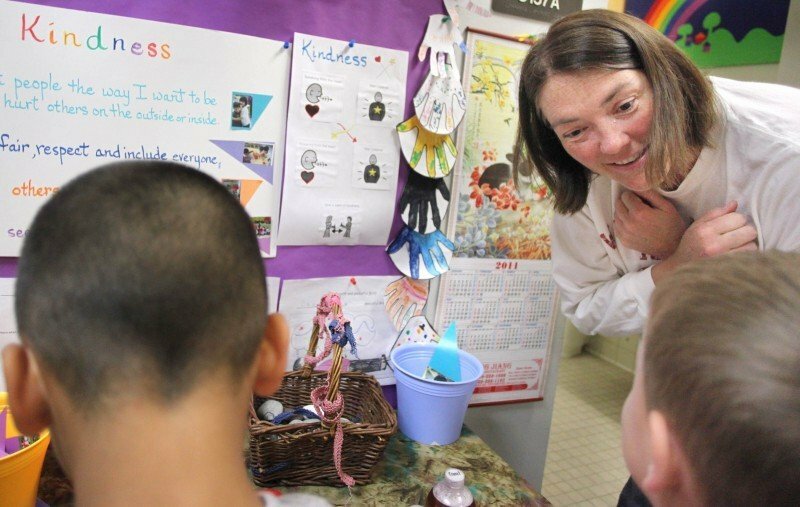 Laura Pinger, the curriculum's lead developer, spent 20 to 30 minutes three times a week with the children, leading them through exercises and activities related to kindness, caring and mindfulness. For instance, whenever a child said or did something nice for a classmate, he or she also would give the classmate a "seed of kindness" made out of paper. Students collected the seeds and watched as their gardens grew. Lynch, the classroom teacher, said the children initially found the concept difficult to grasp. Many programs designed to reinforce positive behavior reward a child who does a good deed with something, such as stickers or points to be redeemed for prizes. In this case, the child who did something nice also had to give something away. "It was a big shift in thinking for them," Lynch said. The activity helps children understand that doing something nice for someone is its own internal reward, Pinger said. It also helps children realize that one of the best ways to be treated kindly is to treat others that way. "If they wanted to have more seeds, they had to give more away," Lynch said. The children were tested before and after the curriculum to examine the effects on their attention spans, their ability to regulate their emotions and their interactions with classmates, said lead researcher Lisa Flook. "The tests are showing positive changes, but it's so preliminary because it's such a small sample," she said. A control group of students who did not receive the curriculum also was tested. This summer, children in a local Head Start program are scheduled to go through the curriculum. This fall, the center is hoping to include some children in the Madison School District's 4-year-old kindergarten program. The benefits could extend beyond just nicer kids, Davidson said. "There are decades of research indicating that the quality of one's attention affects one's ability to learn, and so I think it's very likely that we will find that this kind of curricula has effects not just in the social and emotional sphere but in the academic sphere as well."